The title could be misleading. 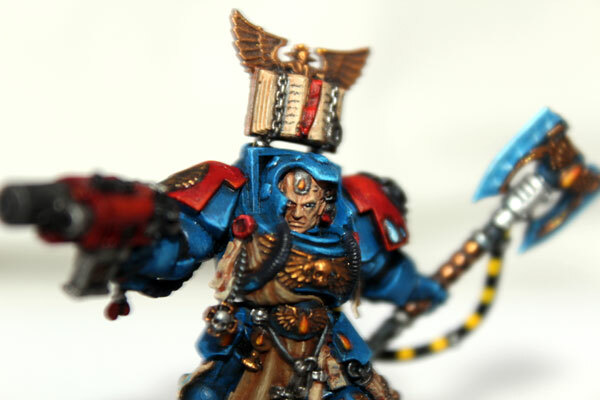 I have this Blood Angels Terminator Librarian assembled already about a week ago. I won’t be writing about boxing out and gluing Blood Angels minis (at least not in this post;). Blood Angels Librarian in Terminator Armour finished! You know, my Space Marines: Blood Angels Chapter is going to be assembled again. Back in the days, I think, it were late 1990s I had nice army with several Blood Angels units – few tactical squads, two terminator squads, two assault squads. Death Company of course, and few heavy, heavy tanks – I don’t remember what kind though. It’s all blurry – the memory of my beginning with Warhammer 40k is so misty. 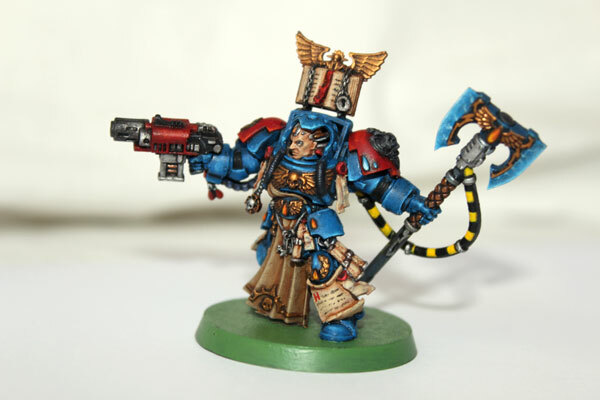 It was the time of 2nd edition – the rules were much more different than right now and Blood Angels and Dark Angels had one codex called Angels of Death. I played only few battles with my BA, I even tried 3rd edition rules ( I was one of many complaining about new rules – I could never adjust my way of thinking for all new movement, shooting and assault phase rules. I stayed strong on conservative side:). and I have abandoned WH40k for long. I was always Warhammer Fantasy Battle guy. I had many armies, I played countless battles, started in 4th edition, I play until now. And I had so much fun with WHFB – much, much more fun then with 40k. Don’t get me wrong – I liked all 40 millennium universe appealing as well, but those days I was more focused on fantasy. Eventually I sold all my Warhammer 40000 miniatures and stuck only with WHFB. Right now I reset all my collection. For some time I get rid of all my minis – those from Warhammer Fantasy Battle too. Two years ago I started to buy new collection from scratch. First Warhammer FB, and starting from this year, WH40k. Blood Angels are my first choice. It’s like the wheel of time made a whole turn. It the same army again – obviously I must be attracted by BA fluff the most (even though I think Chaos Space Marines, Daemons, Orks, other SA chapters are cool too). What I discovered, that comparing to those old 2ed minis – Blood Angels new models are more sophisticated, the sculptures have more details. Codexes offer you more options, more HQ, more squads, more everything. And the releases! Almost every month you have new miniatures for Warhammer 40k! Mother of WH – I think, everyone is satisfied and will get what desired most. Of course, if your wallet is thick enough ( GW is not giving you any nice time here – the prices can get crazy!). I’m back to Warhammer 40k world, just in time – the peak moment for this game system. I already have concluded awesome deal for all Blood Angels models from Deathstorm expansion. Really, I paid like literally, like few pound for them:) (apparently someone needed only Tyranids). And recently, during my stay in Mexico, DF, I’ve got this great miniature of Librarian in Terminator Armour. So it’s a good start. All I need, as a troops option for my first detachment – tactical squads (maybe with some dedicated transports), some heavy support (I was think about Stormraven for the start), and I’m ready to play. After a bunch of Skavens I’ve been painting during last several months – The Librarian was a nice refreshing change. The level of details on this mini is impressive, I mus say. You can complain about GW customer policy, and their prices, and lots of other stuff, but the miniatures they produce are top of the tops. Space Marines especially. Things have changed since 90s, with lots of generic plastic Space Marines miniatures. Unbelievable progress. It makes you want to collect and paint even more (yeah right, like this is even possible;). I painted him, as similar as possible to picture on the blister. 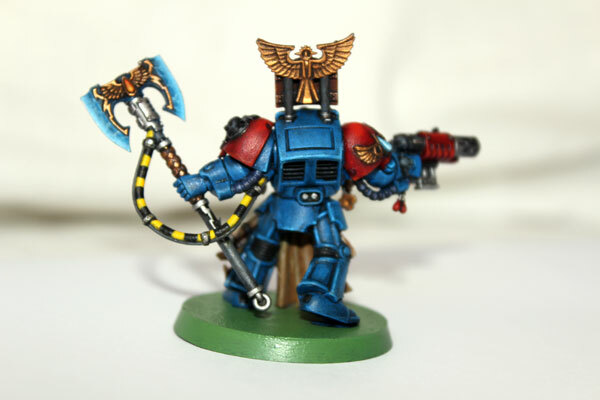 Blue power armour, red shoulder pads, force axe blue – transiting from dark to light with free hand painted lighting. Speaking of free hand painting – I’m not used to to that very often. I don’t feel confident with this enough – sometimes I’m forced to free hand paint, but this is not my comfort zone. This time I said: frak it, I need lighting on the force axe. I opened few tutorials, how the proper force weapon should look like and I’ve done it. I’m not quite satisfied with the effect, but damn, this is my first power or force weapon painted in few years. I will practice more, and I’ll get better with this any time soon (that’s the plan anyway). I also free handed writings in the book and on the scroll. It’s ok – but here also need to paint those tiny details more often to master. 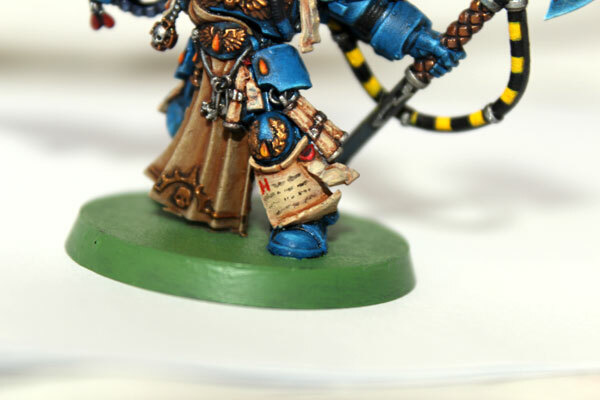 Close up on the scroll. The other thing I needed to struggle with when I was painting The Librarian is my limited box of Citadel Paints. During my journey across Central America, I have very little space for minis and paints. Most of my luggage are clothes and other necessary stuff to survive. Therefore, I have right now with me only 25 paints. I could maybe squeeze in few more, but this will not make any big difference. I don’t have any purple with me for example, so I made the purity seals red. And I have only one shade of blue (Caledor Sky) so I needed to mix the paints to get new colours. Some problems, but nothing I couldn’t handle. As you can see The Librarian looks so, so. All I need to do is adequate basing – but I will handle this after I be back in Europe. And it’s right on time for my today’s battle of 40k. Some time ago I’ve contacted with Warhammer 40k Club Chiapas ( Mexico). We arranged meeting and they offered me, they can rent me some army to play. How awesome is that? I asked if they have some spare Blood Angels to play, and look at that! I’m going to play my first battle in America. 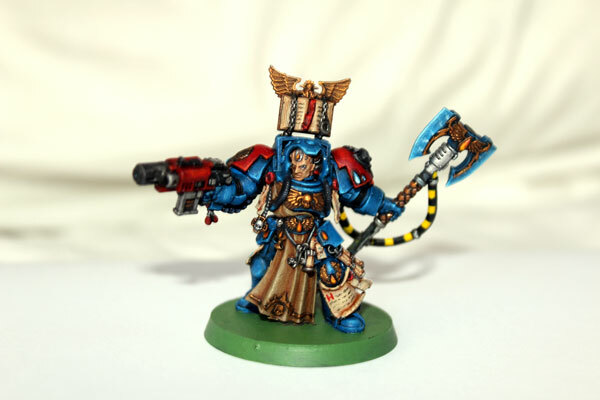 And I have opportunity to include in the army list my Blood Angels Librarian. Awesome again! Pure Awesomeness! It’ going to be his prelude before joining my BA detachment. And when he join, my small Blood Angels force will be assembling again to kick some heretic and xenos asses;). See you on the tabletops soon! Don’t know about the limited palet there- the librarian looks pretty good to me. Librarian looks great. And, some of us never left 2nd edition 40k….. Very nice dude, especially impressed with the face & eyes! It is amazing what you have achieved on a limited palate & whatever light you could get… I take my hat off to you sir.